These queue poles & stanchions are part of our exclusive QueuePole line of barrier systems. 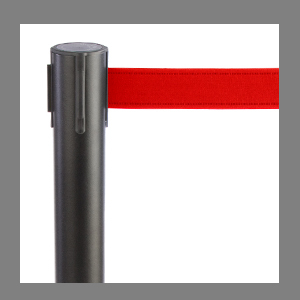 Stylish and attractive queuing setups have many different uses, including simple wayfinding and guidance, safety barricade, line delineation, setting up VIP sections or other special areas, and more. Almost any business or environment can use economical poles & stanchions like our QueuePole post-and-rope and retractable belt systems. In addition, we are proud to offer a wide variety of barrier accessories, including sign holders and toppers, special end-of-line stands or receiver wall units and replacement fabric and nylon ropes and belts in a variety of colors to match any environment. Our economical, commercial grade poles and stanchions are also offered in a number of different finishes and materials in both Economy and Deluxe versions. From single silver fixtures to a full set of black plastic bases with retractable nylon straps striped in branded colors, our huge inventory allows our selections to match every queuing need and budget. What are the different styles of barricade systems and accessories? Queue poles & stanchions are designed for use with either post-and-rope or retractable belt systems. Finishes range from the "traditional" polished brass finish post with a ball top, configured with a red velvet rope to more modern matte black or gloss silver fixtures with tulip or flat-top configurations. 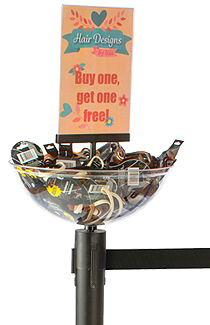 Dual-shade or two-tone stands offer base poles with contrasting color toppers. Along with fabric, nylon and velvet ropes are offered in a variety of shades to match every style or decor. In addition to roping color, hardware is available in either polished chrome accents or traditional brass. Retractable belts are also available in a variety of nylon shades and patterns, from neutral black and gray webbing to bold, attention getting blues and reds. In addition to fabric color, we offer crowd control stanchion straps in different lengths so that the distance between posts can be easily configured to adapt to any space. 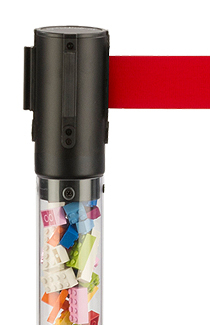 Accessories for wayfinding or directional barricade set-ups can form a key element of any business. Economical QueuePole sign holders are available in finishes to match post constructions, and range from stock messages to simple slide-in styles for labeling to fully custom printed messaging displays. 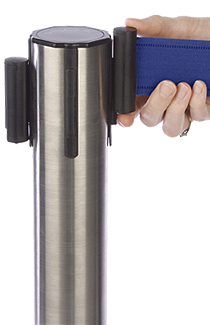 Crowd control stanchions comprise the base, literally, of any barrier-based queuing system. This simple but effective style is seen every day in businesses spanning all industries. Banks can set up post-and-rope configurations in a zig-zag layout maintain orderly lines at teller stations. Movie theater or performance theatres can also use these stylish stands for queuing, in addition to creating time-honored "red carpet" style. Restaurants or night clubs also use systems like these to delineate VIP sections or other restricted areas. 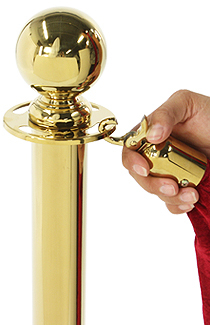 Museums, galleries or car shows use crowd control stanchions and accessories to protect and identify expensive or precious artifacts, merchandise or offerings. The uses for our fixtures are as varied as our selection!